The Outdoor Exhibits include a shaded courtyard with fountain and benches, a protected Courtyard for social and educational events, historic replicas, authentic historical buildings, buildings that house “old west” exhibits of farming and ranching, and a most unique cemetery. For the lawless… There’s the Law West of the Pecos replica building of Judge Roy Bean’s Courthouse … This replica represents a topic of many truths and tales. Also in the park is the Gunfighter’s grave, the jail replica, and the Mesquite House – the oldest house in Pecos. Across from the Museum Park our visitors will find The Chuck Wagon Exhibit along with the Farm and Ranch Exhibit. Both play an instrumental part of our community and surrounding area’s heritage. The West of the Pecos Museum building is an exhibit as is the historic Orient Hotel, that opened in 1906. See Historical Marker at front entrance. 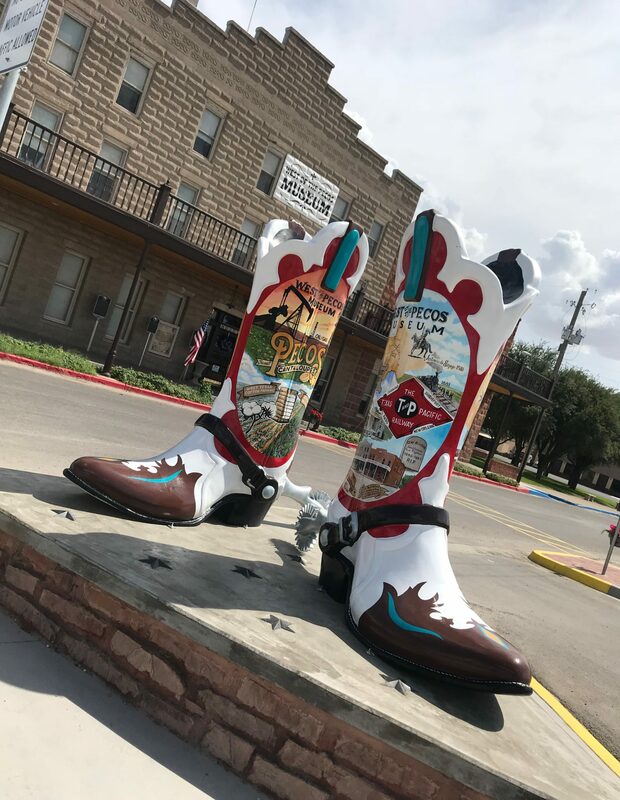 The Pecos and Reeves County area is home to hundreds of “Historical Markers” and makes for a truly wonderful, informative excuse to get out and visit our community. To really appreciate the dedication, stamina, and toil of our pioneers, one must stop and reflect upon the facts depicted on the markers. Be sure to visit the Markers placed on the steps at the main entrance to the West of the Pecos Museum. Historical Markers are placed along the roadside, in front of buildings, and anywhere else they may be viewed with little effort. The markers are not unique to the Pecos area as this is a historical campaign of the State of Texas. Download a map of the markers placed in Reeves County – at the Texas Historical Commission Atlas page.